So Easy, Even Nikki Can Do It! 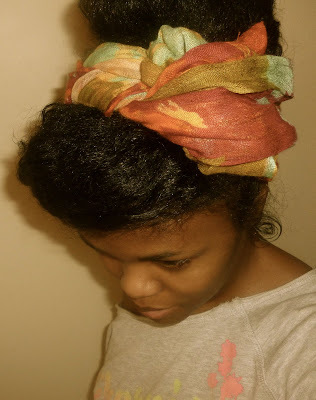 So this morning the lovely Shanti of A Curls BF submitted a guest spot called 'Tutorial of the Retro French Twist With Headband' (below). Per their style, the 'do was incredibly chic and after taking a peak at the very succinct video (I thank you), I'd be lying if I said I wasn't excited. No french braiding, flat twisting, levitating or other magical maneuvers involved... I was game. I emailed Shanti and was like, 'after your retro hair style post and Mara Hruby from yesterday, y'all have got me itching to try something new...' and she was all, 'DO IT!!! Readers would get such a kick out of seeing you try something out of the norm.' So looky what I did! I can't tell if I feel more like Lucille Ball or the Tropicana lady, but either way, I got the swag sauce I'm dripping swagu. a french roll in all my 28 years. When I think of french rolls I think of floor length furs and gold jewelry of church conventions past. Obviously this is no headscarf. I had to make due with what I had on hand... a Tarjay neck scarf chopped in half! Got an easy tutorial for the 'styling challenged'? Send me the link so I can try them and share them! Where are y'all buying cute scarves? I almost forgot.... Forever 21 has cute scarves. thanks chica! I really like it I just don't know if I have the guts to leave the house with it. Very retro glam, too cute! I get scarfs from the BSS, Forever 21, & Express. @ k. lynn you get a point, lol! I think I may find a cute wide headband instead. Thanks! You look fierce! I love this on you and you should definitely go outside with it. Its classy. I'm going to try this right now! There's a shop here in NY in lower Manhattan (walking distance from my day job) That sells all kinds of prints for $5 a scarf. I picked up 4 about a month ago and love them because I can tie them on my head, on my purse or around my neck with just about any outfit! Hmm think I need to do a scarf haul soon. very cute! u can also wear it with a jeweled headband- the wide kind and the kind that has the one that wraps around your head..hard to describe but the 'band' part is similar to the cute target headbands you got last year (one with the flower). Naptural85 just put out a cute video that you could do. It's her most recent one with the headband! Check it out! Too pretty and so glam Nik! Love it! 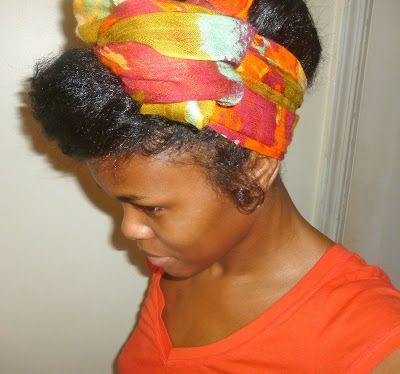 I Used to rock the French twist all the time in college! I'll definitely have I give this a whirl. And gurl, don't you keep that cute look in he house! You need to show that off. It's all about he swagger! This is a beautiful style... I bought some 99 cents neck scarves two years ago and I will put them to good use!!!!! I pretty much live in scarves; it's a problem. TJ Maxx/Marshall's/Ross usually have super-cute scarves for reasonable prices. Also, thrift stores. I'm not talking Goodwill/Salvation Army (though I have found some cute buys there), but if your town has a Junior League/Assistance League/Other Social Organization for Upper-Class Women? Those organizations usually have thrift stores with higher-end merchandise. I don't know how many silk scarves I've picked up from those places. I got a few cute scarves from the local beauty supply place. Very reasonably priced and quite the selection. Also I have been adapting ties and fabric belts from a few of my dresses/outfits into head scarves. Nice to switch it up from time to time. 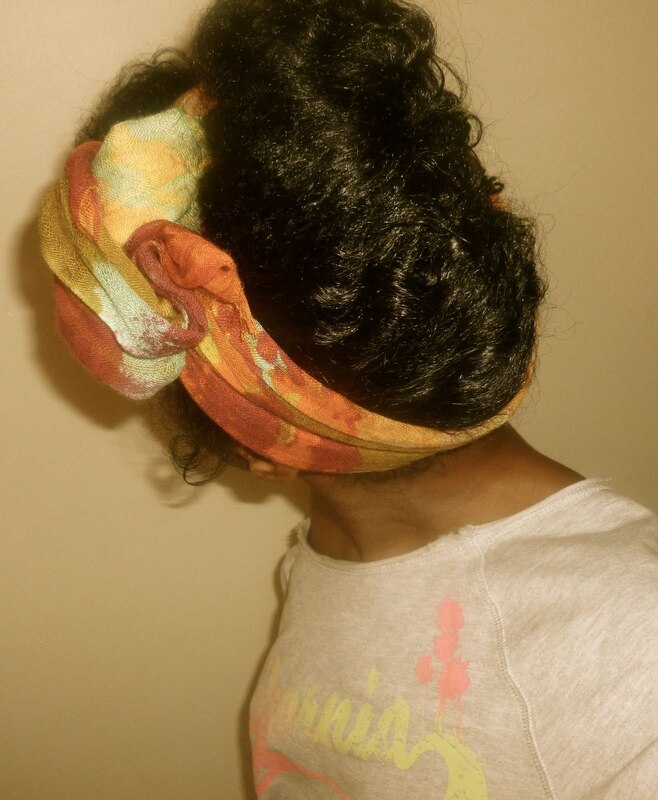 The scarf looks great, just experiment with different patterns and colors til u find your "AHH HAA" moment in hair accessories. This looks amazing on your Nikki!! I love this look! I am definitely going to try it. 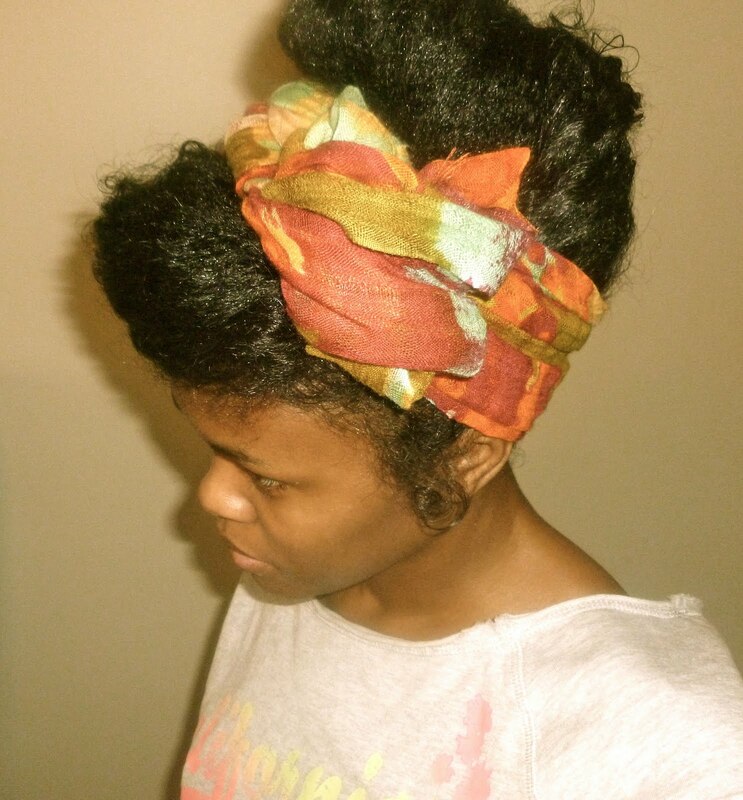 You can actually find great scarves at vintage shops and thrift stores for great prices. That's where I get all my scarves. Nikki this suits you, I think I may try it too! I get my scarves at TJ Maxx and Pennys. You a bad girl and ya friends bad too, OOH! LOVE IT! Can see this paired with a pair of skinnys, off the shoulder top and heels! Looks like I'll be going scarf hunting this weekend! Thanks! Don't like it!! 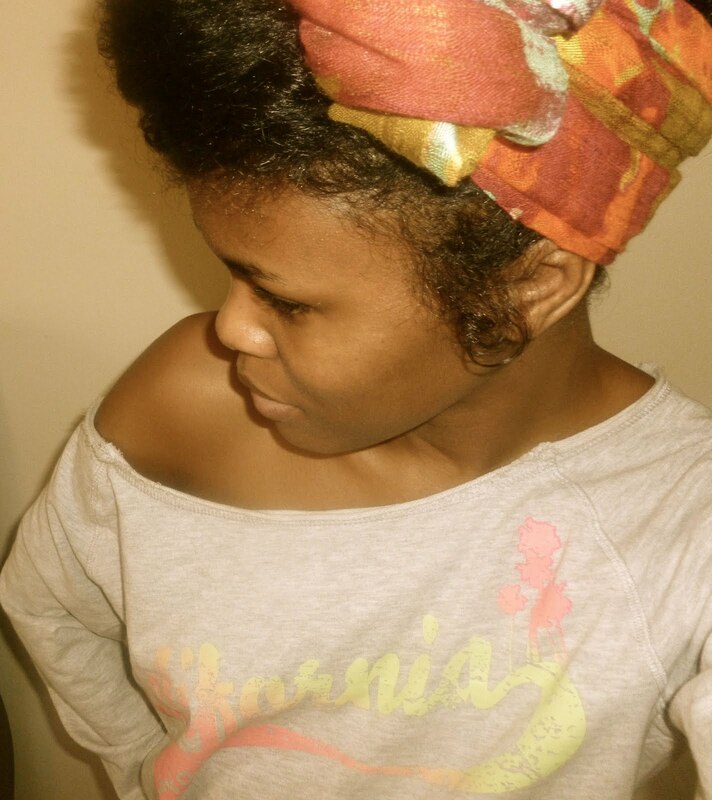 It look like you are setting your hair up and out of the way for cleaning the house. you can stock up on scarves at forever 21 for cheap too. Girl, go outside and see how many compliments you'll get! It is absolutely adorable! 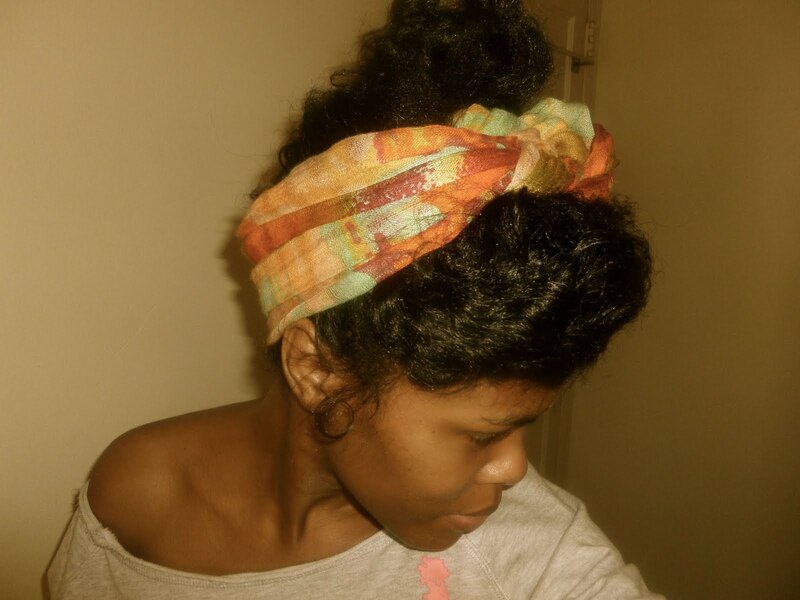 As for cute scarves, I've found lots at the thrift stores. Designer, silk and cheap. Just a thought. im trying this TONIGHTTT . VERY CUTE!!! I loooooove to accessorize with my many scarves. This will be after rainy day (I don't wanna take my haire down do:-) H&M had nice scarves also. I have recently found a few @ my local beauty supply stores as well.